The cash position overview provides information on the current financial state of the bank accounts. It is the starting point for cash concentration in which the balances from various bank accounts are concentrated in one target account, taking minimum balances and payment optimization into consideration. 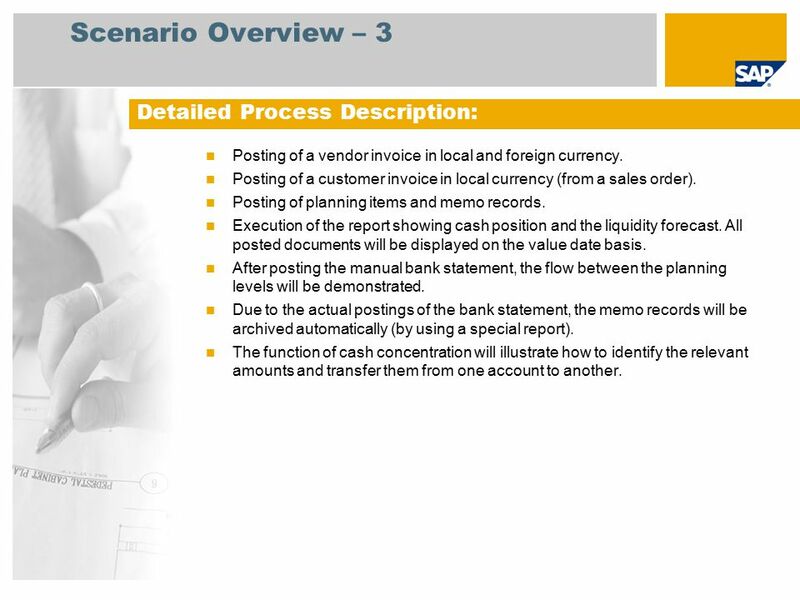 The example in this document shows a posting process that affects liquidity (customer invoice and incoming payment). It presents the main functions for retrieving information about the liquidity status. 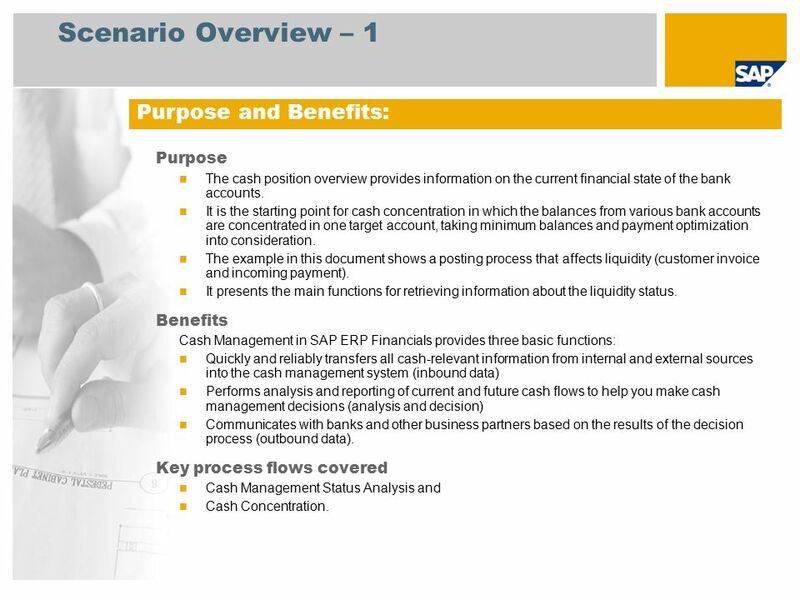 Benefits Cash Management in SAP ERP Financials provides three basic functions: Quickly and reliably transfers all cash-relevant information from internal and external sources into the cash management system (inbound data) Performs analysis and reporting of current and future cash flows to help you make cash management decisions (analysis and decision) Communicates with banks and other business partners based on the results of the decision process (outbound data). 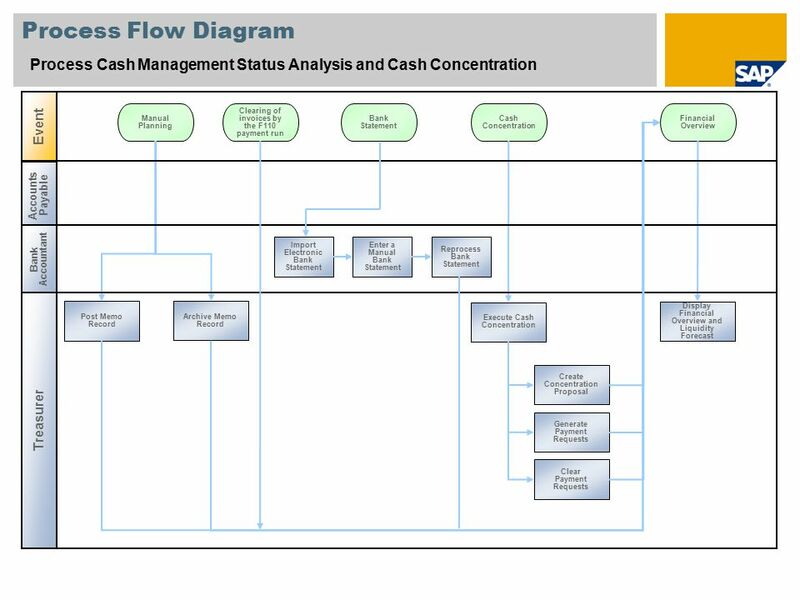 Key process flows covered Cash Management Status Analysis and Cash Concentration. Posting of a vendor invoice in local and foreign currency. Posting of a customer invoice in local currency (from a sales order). Posting of planning items and memo records. Execution of the report showing cash position and the liquidity forecast. All posted documents will be displayed on the value date basis. After posting the manual bank statement, the flow between the planning levels will be demonstrated. Due to the actual postings of the bank statement, the memo records will be archived automatically (by using a special report). The function of cash concentration will illustrate how to identify the relevant amounts and transfer them from one account to another. 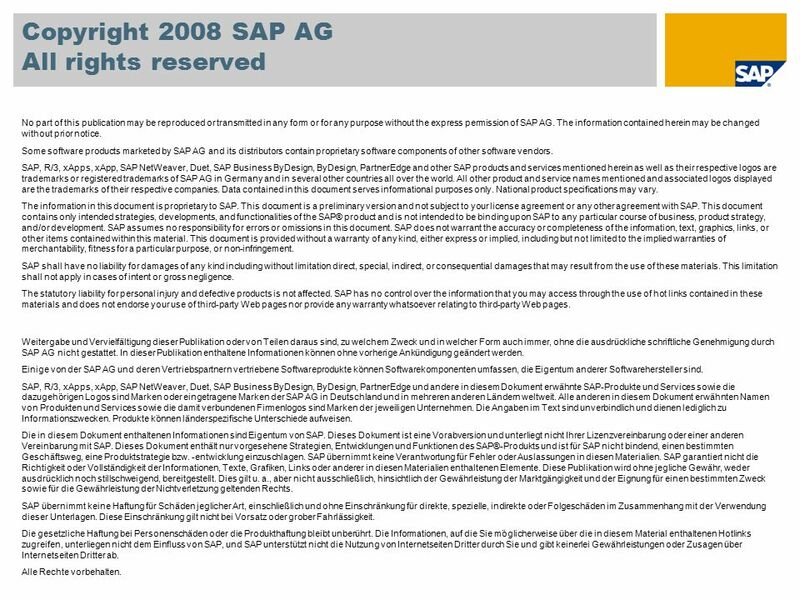 Herunterladen ppt "Scenario Overview – 1 Purpose and Benefits: Purpose Benefits"
SAP AG 2011, Introduction to SAP Business One 8.8, GTM Rollout Services Page 1 SwissAddOn Installation und Setup Allgemein: Zur Abdeckung Schweiz-spezifischer. 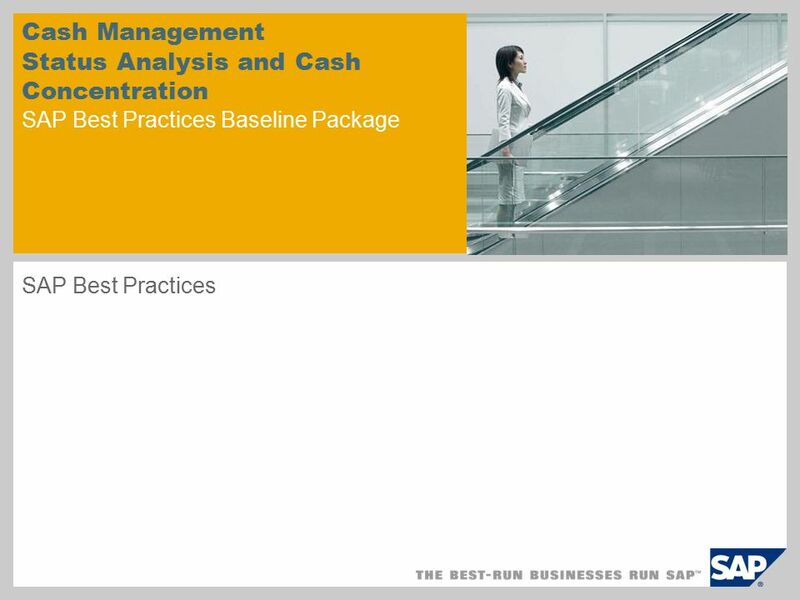 Organizational Change Administration with Funds or Grants Management (978) SAP Best Practices. 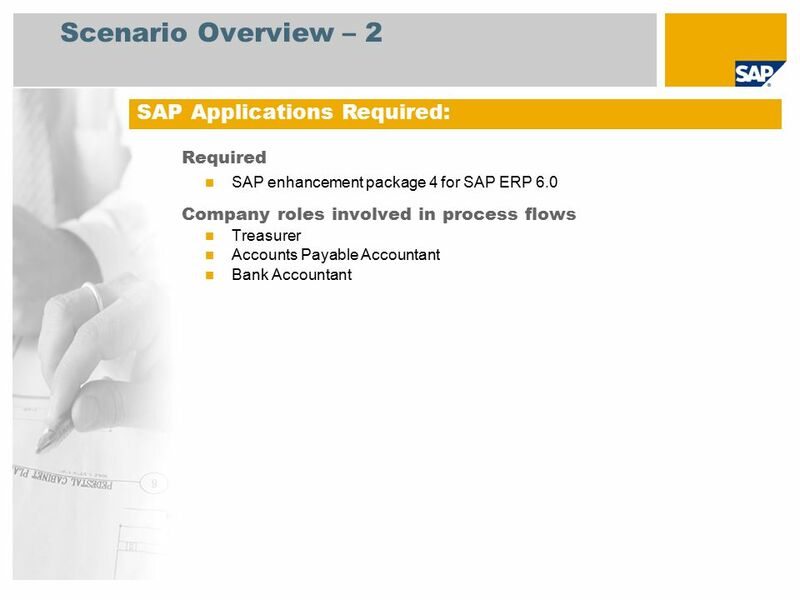 Service with Time and Material Based Billing SAP Best Practices Baseline package SAP Best Practices. 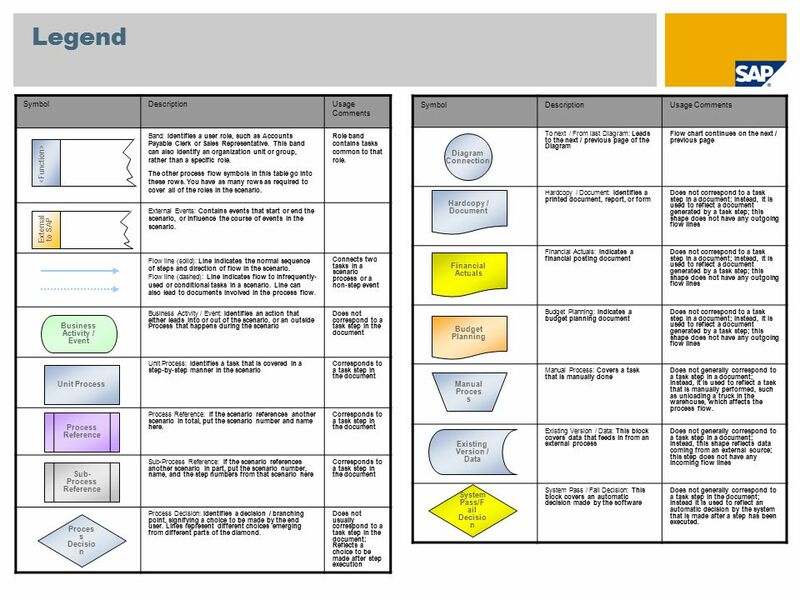 Internal Projects SAP Best Practices Baseline package SAP Best Practices.